Halo-halo is very in demand during summer season. Halo-halo is a mixture shaved ice, fruits such as avocado, sweetened banana, red small beans, jackfruit, pinipig, and more, and with evaporated milk, sugar according to your taste. Others they put leche flan with ice cream or ube on top instead of sugar, and served in a tall glass or bowl. 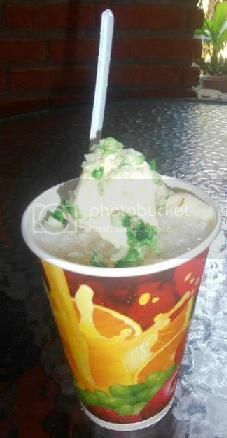 Halo-halo photo below is in the FIR (Fort Ilocandia Resort) during holly week season. Our family spends in Ilocos for 2 night and 3 days. This is the first time to eat halo-halo in Ilocos. Because the weather is very hot condition we tried to ordered halo-halo to refresh and put off the hot weather.